I have been out of Internet contact for a while. Rather than go deep in this post, I am going to go broad and give a taste of the many things I have experienced here. Each morning we have a plenary worship, led by a different part of the world. The sermon given by Churchill, from Kenya, was especially moving. He spoke about creating connection by overcoming individualism and opening up space in our hearts, our homes, our churches, our communities and our countries. He brought to life passages in the Bible, and told contemporary stories. One of the most moving for me was about a bus of Christians and Muslims that was hijacked by Boca Haram, the Islamist terror group responsible for so many massacres of non-Muslims. When the gunmen tried to separate the Christians from the Muslims, the Muslims refused, saying the gunmen could either murder everyone on the bus, or none at all. And the gunmen retreated. I attended a variety of workshops and consultations. The consultation I chose, which continued for four sessions, was about how we create active, vital Quaker communities. I only attended the first, because I needed time to work on this blog. But it was much richer than I expected. A Quaker historian living in Germany outlined a research project she is undertaking about the untold story of the remarkably large number of Jews who were saved and then assisted by Quakers, in spite of Quakers’ relatively small numbers. Another workshop outlined the sometimes-violent modern history of Kenya and the work of Quakers to build the structures necessary to foster a peaceful civil society. It again struck me that our pantheon of Quaker “saints” does not include those who are doing work in Africa and other places that is as courageous, spirit-filled, and inspiring as John Woolman or anyone else. We really need to learn about and acknowledge this broader Quaker history, for these are our brothers and sisters, acting out the peace testimony and circumstances that are more challenging than we can imagine. I have heard great things about the Bible study, led by Janet Ross from Britain, who was my co-leader of our home group in Kenya. But I have chosen to attend the early-morning silent worship, which has been very rich. One man spoke about a recent report by Oxfam that 1% of the world’s people now own 50% of the wealth. He compared the story of Nicodemus, one of the 1%, who came to Jesus secretly to be taught, and the story of the unclean woman who touched Jesus’ robe, one of the 99%. He compared this to people in the gathering including people like himself, who might be part of the 1%, with the others from poorer parts of the world, who are part of the 99%. And referring back to the comment of Simon Lamb in our opening session, he said that the poor and disadvantaged, coming from chaotic and sometimes desperate circumstances, often embrace the Truth with a revolutionary gusto. Whereas for those in comfortable and advantages circumstances, the Truth can come over a longer period of time as a gentle, transformative rain. But the end product in both cases is inner peace. As it turns out, three of us have some sort of geology background, and a discussion with a dear Nepalese Friend of the recent earthquake that wreaked such havoc on the lives of him and his people, got us started talking about the plate tectonics, the origin of the universe, natural catastrophes and apocalyptic beliefs. It was a very animated discussion. 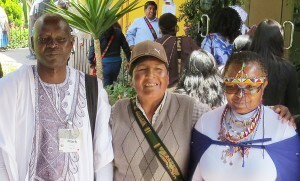 I referred back to my exchange about the origin of mountains with the Peruvian pastor. (See previous post.) I picked up my coffee cup and said that when I see with my own eyes that it is purple, part of my faithfulness is honouring that truth. When I see the evidence about plate tectonics, I simply cannot ignore it. If it conflicts with my religious beliefs, then I need to figure out how to integrate those two systems of thought. Our Nepalese Friend responded to this discussion by saying that Jesus exhorted us to become like children again, and that to him this meant maintaining a simple, strong faith in the words of God as revealed in the Bible. To get confused by all these other ideas would only distract him from the central purpose of his life to be loving and peaceful in the name of Jesus. We all walked away to the rest of our day not having changed each other’s beliefs, but certainly understanding each other a bit better. In other words, being in unity not in our heads, but in our hearts. Regarding business, FWCC, like so many service-related organizations, is struggling financially. It is the Europe and Middle East Section that contributes about half the funds, and funds from the US are projected to decline. We considered the frequency of the plenary gathering, which are hugely expensive, and made changes to the constitution that are related to this frequency (every ten years minimum, hopefully between six and eight years), and how to govern the organization in a way that is appropriate to its shrinking resources of time, money and staff. We have hired Michael Wajda to review our fundraising practices and make recommendations. A lot of time was spent drafting recommendations on how individuals and Meetings can help combat climate changes. I will pass these on to Meetings as soon as I receive them. One of the most enriching parts of this gathering has been connecting with other young friends. We are all going through similar processes of finding our place in the world and in Quakerism, however are doing so in very different contexts and from a diversity of backgrounds. Last night we had our second gathering of young friends. We came together to share laughter, questions, stories, inspirations, and concerns. It was lifting to feel a community of young friends beginning to form. We divided into small groups of young friends from different yearly meetings and shared stories about our experiences as young friends. 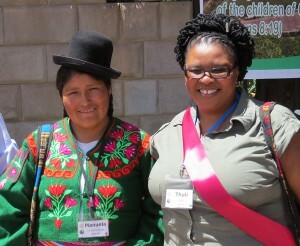 My small group was composed of five other young women from Ireland, Kenya, Mexico, Norway, and the Netherlands. I heard stories that felt similar to my experience, and others that stretched me to consider other aspects of my identity as a young Quaker. In our small group there were Friends who felt isolated in their Meetings, and others that were upheld by a strong community of young Friends. We touched on the role of women in our Meetings, the dynamic between older friends and younger friends, the types of gatherings we have and the large range of numbers that we have attending our youth gatherings. We reflected on the transition between being a young friend and a ‘full’ adult in the Meeting. I was exposed to joys and challenges experiences by young Friends from around the world. After this rich discussion we transitioned into simultaneous music making, games, discussions, and a precarious game of indoor frisbee. We spent hours into the night getting to know each other and sharing parts of ourselves, continuing to build a community of young friends that will continue beyond just this gathering. The work being done by this consultation group is significant as it will have an impact on the future of youth programming at the FWCC level. As a group we encouraged each other to dream. Out of this dreaming came ideas of youth exchanges between yearly meetings, internal national youth pilgrimages, mentorship programs, section wide youth gatherings, and online spaces that could keep us connected. Three main ideas that came out of this group are 1) to explore the idea of holding another World Gathering of Young Friends, 2) to create more connections globally through a stronger online presence, and 3) to design a type of QYP 2.0 to carry on the work of QYP in a way that fits today’s context and concerns. The report will also include a request that FWCC begin a conversation on international membership for young Friends. What do I get from Quakers? What can I offer Quakers? What do I need from Quakers? We will continue to meet tonight to hold these questions and the future of young Friends in the light. I look forward to sharing the work that has been done with and by young Friends in gatherings at the plenary and the consultation group. Thank you to all who have been holding me and Steve in the light. I have felt very held. Thank you for opening the space for me to participate in this gathering, which has brought me great learning and sharing. I have had conversation after conversation here that have touched me deeply and will leave me changed in various ways when I leave. But I would like to relate a personal incident that happened that maybe characterizes the challenges that can be part of the FWCC experience. Yesterday morning, I was in our home group, which is composed of a dozen people or so from all around the world, and from a broad spectrum of traditions. I mentioned about how deeply I had been affected growing up near the incredible beauty of the Rocky Mountains. 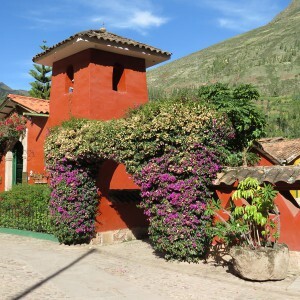 I still felt stunned the day before by the magnificence of the landscapes we had passed through on our tour of the Sacred Valley. I spoke about reflecting why these mountains are here. I described a vast mass of heavier rock stretching out below the Pacific, being pushed under the lighter rock of the South American continent, causing it to crumple up and then be carved into valleys by the rivers born from the precipitation that is forced to fall over the higher land as the air passes over. And what fuels the movement of this vast mass of rock? Residual radiation from elements cooked up the oven of an exploding star billions of years ago, heating the earth’s core, causing the molten rock to circulate up towards the surface. I said that this is utterly remarkable, and that if this was not a revelation of the creativity of the Divine, what is? Immediately, a Bolivian pastor talked about how these mountains are here because of the Biblical Flood, and the talked about false teachers doing the work of the devil by leading the people away from the Bible which is the source of truth. To close the session, I asked him to lead us in a prayer, which he did, and afterwards I thanked him for listening to my difficult words. I checked with others afterwards, and they assured me that what I said came across in a loving and non-accusatory way. 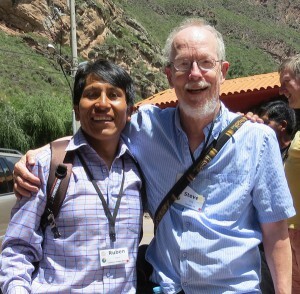 I was afterwards gently eldered by someone who talked about learning to just accept the Evangelical Latin American Friends where they are at—in other words, to not respond. But I wondered whether we lose an opportunity to build connection when we hide our own truth by assuming someone else is incapable of hearing it? I felt no anger towards him. I had no stake in making him feel bad. I was feeling hurt, and rather than pretending to be okay, and perhaps then feeling separated from him because of that hurt, I wanted to let him know what was really going on with me. I saw him a little later near the lunch line, and we talked in a very friendly tone about how nice the pool was. And every time we have crossed paths, it’s been with a sincerely warm greeting. I don’t know exactly what was in his head and heart when he spoke those words. I was not paying attention to how my response was translated to him and I don’t know how he understood it. And I cannot underestimate the vast gulf between our backgrounds. For him to be part of this kind of circle, and for me to speak to him the way I did, may have been very foreign to his experience. I have included pictures of people of the conference (none of whom are in my home group). It’s a greeting I’ve heard hundreds of times in my life; only this time I hear it twice, in both of my languages. 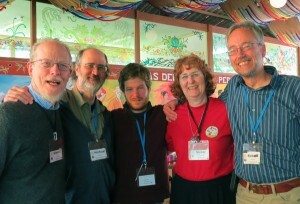 Along with a diversity in cultures, age, and Quaker practices, the plenary has brought together a diversity of languages. There are at least five mother tongues present. It has been a gift to be part of such a large multi-lingual gathering. As part of the minority that can speak both Spanish and English, the conference has it’s own particular flavor. In smaller groups I am often prepared to translate if there is no other bilingual person present. There are many things I am grateful for in terms of knowing both languages in this context; hearing ministry in its original language, being able to help when I can see there has been a misunderstanding, and if I miss one of the (many) announcements I get to hear it a second time. 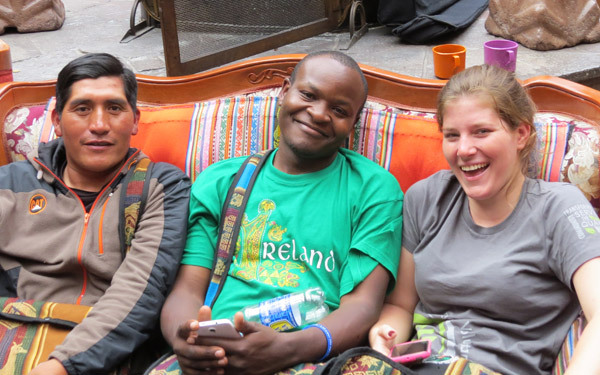 I have been able to make connections with many Peruvian and Bolivian Friends, laughing, sharing stories, and talking about the challenges we see facing our community. But perhaps most importantly for me, being a bridge between these languages has increased my attentiveness to Friends’ ministry. Even in cases when I am not the translator responsible for the session, I find myself asking ‘What words would I use to help others understand this message?’ I’ve begun to practice this even when translation is not necessary. At times it is necessary that I translate messages that I do not agree with, using language that I do not identify with. This too, helps me deepen my faith. In these cases, I am called not only to translate the language, but to look beyond the words to the meaning behind it, to find our common beliefs. Thinking about how to convey another friend’s message so that it carries the intended meaning has deepened my relationship to ministry. Faith translation, in quite a literal sense. The other night, we had a Young Friends Meeting at which there were about 65 young friends in attendance. The energy was excited and enthusiastic! This was the first time I had been in such a large group of Young Friends, and it was hope-giving. We played a game at this Meeting in which someone in the middle of the circle would call out a phrase that applied to them and all those in the circle to whom the phrase applied to would have to get up and find another seat. For example, “All those who have been to a Young Friends gathering in the past.” And anyone who that applied to would jump up and scramble to find another seat. There was always one seat less than the participants, so someone always got stuck in the circle. This was fun and chaotic. During this simple game, it was necessary for us to translate what was being said by the person in the middle of the circle. However, those who had understood the message the first time often began to move before the translation had been finished. We stopped and reminded ourselves that it was important to pause until everyone understood the message before taking action. This is a practice in patience and compassion. I find myself being asked to listen closer, to pause. Much in a similar way as when I listen for the Light while in silent worship, I find myself being challenged to open myself to truly listen to other Friends, especially when the initial message is not something that I feel I can fullyagree with. This continual practice of listening is a process that generates transformation of my faith. When I translate a message, it continues to be the other friend’s ministry, but it is inescapable that part of myself joins their message. Though helping to share Friend’s messages, I not only become a witness to their ministry, I become part of it. We are currently half way through the Plenary, and I can’t wait for the experiences and conversations that are to come in the rest of the week. PS. The internet is too slow at the moment for me to upload any photos, will do this when the connection improves! !